With the exception of Mulatu Astatke, Mahmoud Ahmed is probably the most well know musician from Ethiopia. He has been featured on three of the Éthiopiques volumes on Buda Musique (numbers 6, 7 and 19) and has recently released a live album. He still records and tours to this day, mainly in Europe. Mahmoud Ahmed was born in the Mercato district of Addis Ababa, but he hails from the Gouragué people, who live south-west of the Ethiopian capital. The Gouragué are known for their cuisine, their diligence in business, and their exuberant traditional dances. Young Ahmed showed little aptitude for schooling. Only music interested him, and instead of studying, he would spend his hours listening to the Tèquali Radio, to bands like the Imperial Body Guard Band, and singers like Tilahoun Gèssèssè. As a result, Ahmed soon wound up shining shoes alongside other poor, going-nowhere boys in the capital. In 1962, Ahmed took a position helping out at the Arizona Club, one of the semi-legal night spots that were popping up in Addis in those days. This was the time when Ethiopia’s Emperor Haile Selassie, in power since 1930, began to sense that his country was slipping away from him. In an effort to appease roiling popular sentiment against him. Sellassie would ultimately relax restrictions on music production, formerly the sole province of the state cultural organization and recording company, Agher Feqer Mahber (“The Love of Country Association”). This paved the ways for Ahmed’s early releases on Amha Records. But first, Sellassie allowed state bands, like the Police and Army Orchestras, to create side branches that played popular music. Sellassie had had a hand in creating these brass orchestras when back in 1924 he invited 40 Armenian musicians refugees to come to Ethiopia as state musicians. Despite their new liberties, these institutional bands were technically barred from performing except when on official government contracts. But many defied this law. As it happened, the Arizona Club where Ahmed worked became a favorite moonlighting hangout for the Imperial Body Guard Band. One night when the band’s lead singer failed to show, Ahmed persuaded the band to let him sing a few current hits. Arrangers Sahlé Dègado and Girma Hadgu took up his cause and gradually introduced him into the band’s official lineup, where he remained until 1974. Ahmed recorded his first 45-RPM single in 1971. Here is a discography that lists just about all of Mahmoud Ahmed’s releases, including early singles and cassette only releases…But it does not look like this record is listed. Catalog number is C-0284 on Hitachi of Japan, distributed in Ethiopia by E. A. K. of Addis Ababa. 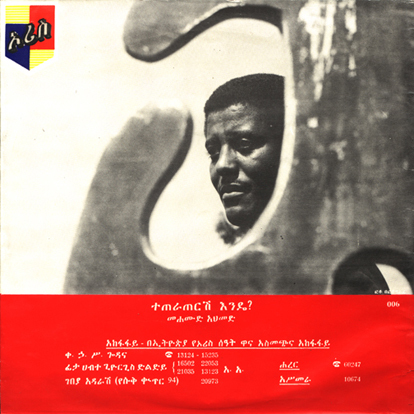 This record originally came with a pamphlet, all in Amharic, which you can view here.